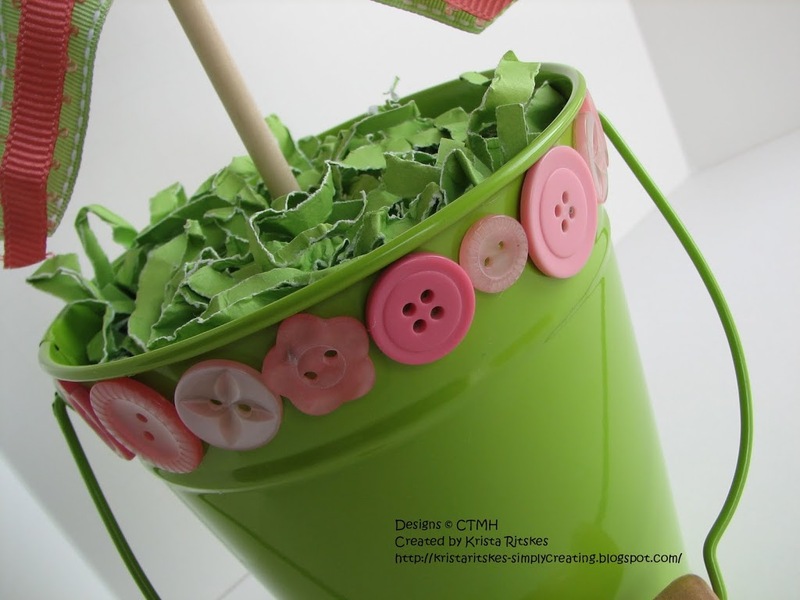 I bought this bucket from Michaels in their garden decor section. Just used my hot glue gun to add some buttons from CTMH’s pink button assortment. The fill is pear cardstock put through our shredder. I spritzed the pile with water and then scrunched it up in a ball and let it dry. Then I spritzed it again a little before putting in the bucket; I wanted to make sure it wasn’t going to pop out and show the floral sponge I have in the bottom! The dowel was cut from a piece I had lying around. 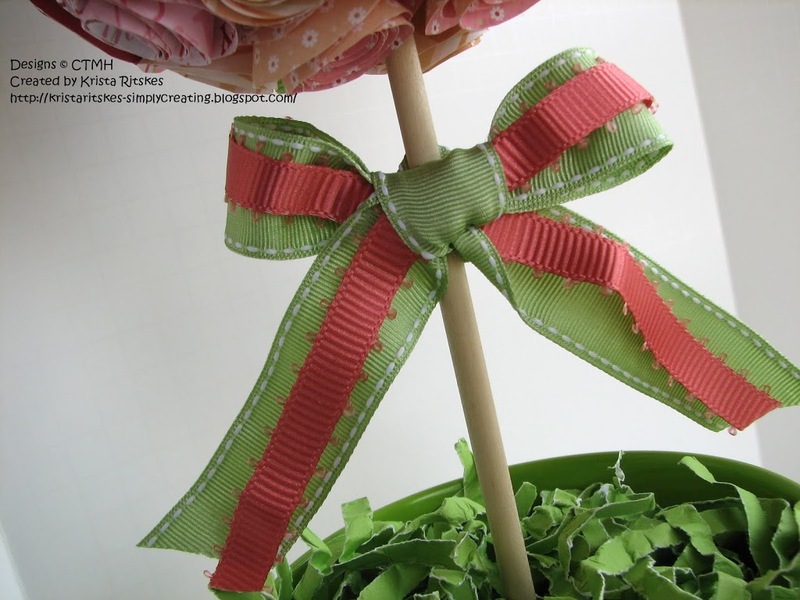 The ribbon bow was made with CTMH’s sweet leaf ribbon and one from the Designer Ribbon Pink Collection. 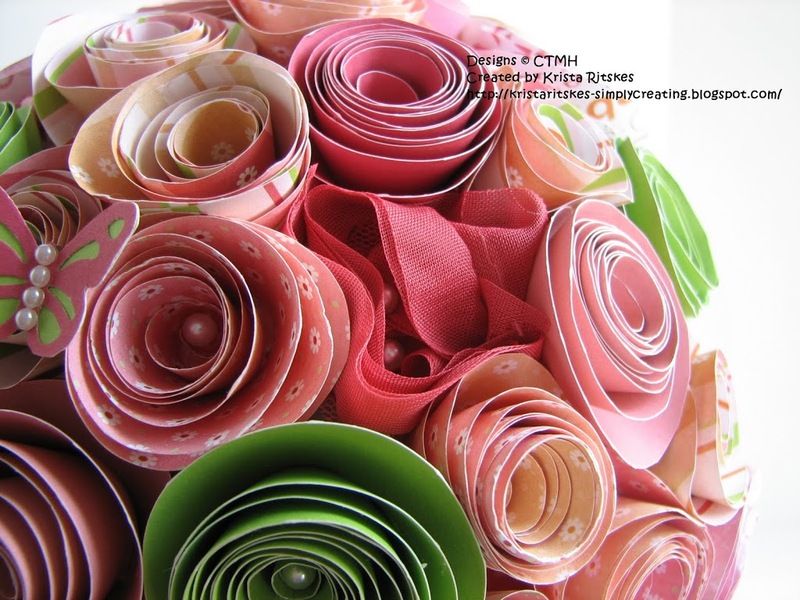 Most of the flowers were made from a Sophia Level 2 paper pack. I added in a few made with pear, blush and hollyhock cardstock. I also had to add 4 made with Sweetheart Level 2 because I ran out of Sophia paper! And to fill in the spaces, I also made little flowers with the other ribbons in the Pink Collection. The only thing holding those flowers on the styrofoam ball base is some pearl-topped pins. I’ve spend about a month off and on creating the flowers. I’ve actually used up quite a bit of Liquid Glass! 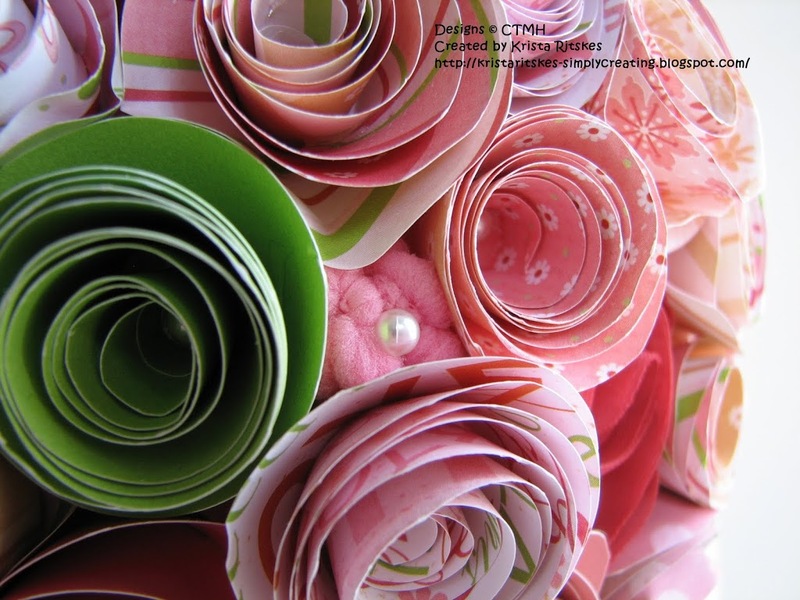 There are about 80 paper flowers and 10 or 12 ribbon ones. Did you see the little surprise hiding on the side of this photo? There she is! I used a Martha Stewart punch to create this little butterfly and then added some Pearl Opaques to the body. I love how it turned out! Even my hubby, who sometimes doesn’t react very much to my artwork, was impressed. I think I’m going to have make one for us to keep, maybe to put on our mantle. We’ll see. 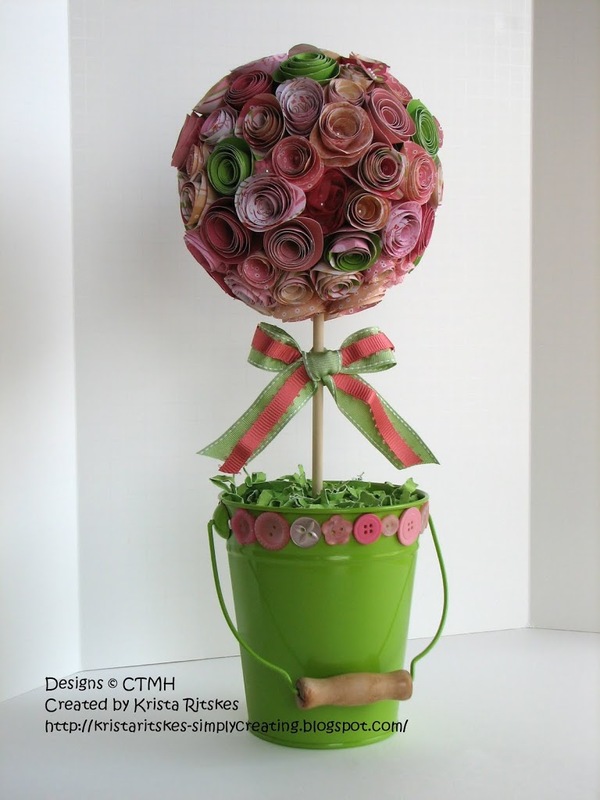 Wondering how to make these roses? It’s really quite simple. Cut a piece of paper in a square. I used 5×5 for the big full ones and threw some 4×4 ones in there, too. Freehand cut a circle and follow the curve to cut a spiral right to the middle. Then, using a quilling tool or just a pair of tweezers like I did, begin at the outside and roll the spiral up tightly. 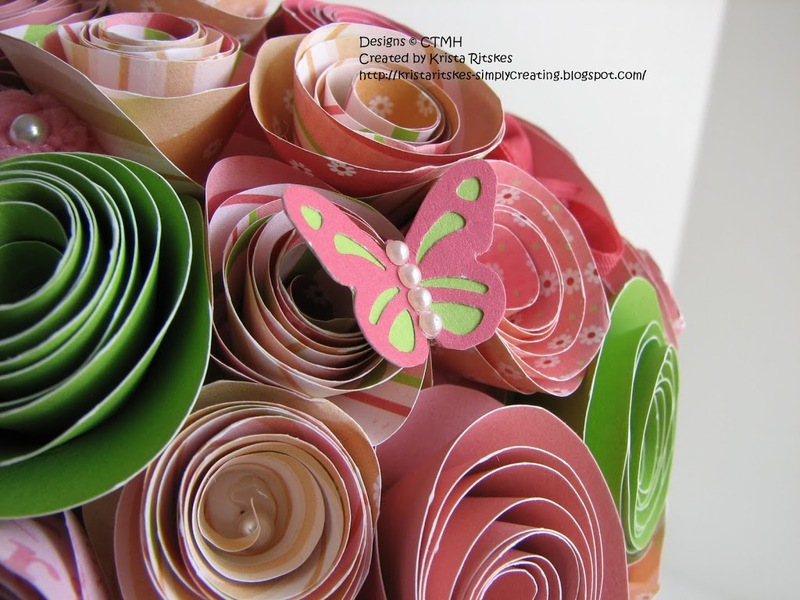 As you get to the middle of the spiral, the paper will begin to look more flower-like. Place it on your table, positioning the rolled flower on the centre circle that was left when you cut into the middle. That’s your base. 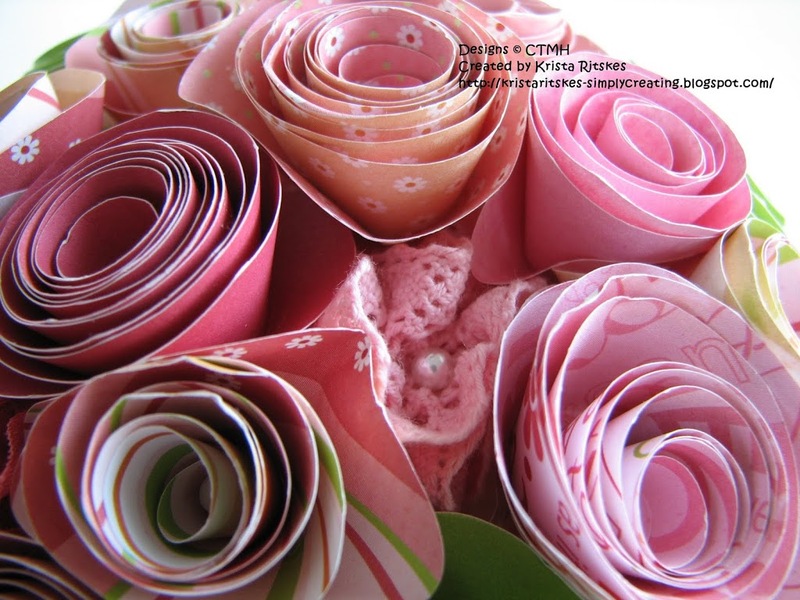 Hold it gently with your finger on the top of the rolled flower and allow it to unroll to the point you’re happy with. Squirt some Liquid Glass under the rolled flower on the base, press down lightly and then add a big dollop to the very middle. I like to add some down some of spaces formed when you unroll the flower, between the “petals”, just for some added stability. You can stick a sparkle or opaque down the middle to finish it off. My pins did that job for me. Oh my Krista!! Absolutely stunning!! LOVE IT!! OH MY AMAAAAAZYING! Beautiful beautiful work! This is an amazing work of art! It will be a big hit at the auction! Thanks for sharing how you did it. Love it Krista! I can attest to the amount of time it takes to create one of these topiary. Yours is GORGEOUS!! Krista, this is amazing! Great job! I love it when the hubs gives his approval…them you know you’ve really impressed! This is simply stunning! You’ve inspired me to try to make one myself. Can you tell me about how tall is it and/or how big of a styrofoam ball you used? Thanks for sharing this and I’m sure it will be a huge fund raiser at the silent auction.